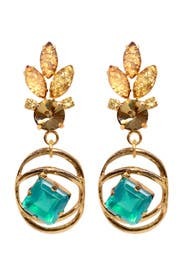 Look and feel like a goddess in these emerald beauties by Lulu Frost. The earring to take your black tie look to the next level! Brass castings with resin stone and glass crystals. Sterling silver post backs. 3.75" long. Lightweight. Honestly tied the look together! They are gorgeous in person- no pic can do them justice! When I first put them on, they were a tad heavy. But to be fair, I don't wear earrings that often. And nothing this big. But, I forgot about the weight and was used to them in a minute or so. They are a stunning color, and speak for themselves. They are the only piece of jewelry I wore aside from my wedding ring. I was very impressed when I put these on, I would have kept these if I could have!! These aren't as 'dainty' as I thought they would be but I loved the way they looked and got tons of compliments on them. Not too heavy and just the right amount of bling! These earring s were really beautiful and weren't that heavy thanks to the back clip that held the stud in place. Beautiful with my light green dress! I would wear these again. I love, loved these earrings. They are large, but not heavy. So fun. The earrings were nice but they looked cheaper in person. I wore my hair down so it hide them. 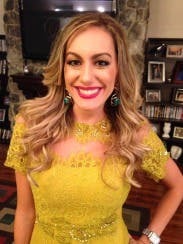 However, the green in the earrings was a much added pop of color. LOVED these earrings. Although they look heavy, they are actually really lightweight and they don't have the removable backs that fall off so they're perfect for a long night of dancing, or anything else. If you like gold, or emerald, or the combination of the two, these are definitely a great bet. They really dressed up the look! Light weight and spectacularly beautiful! 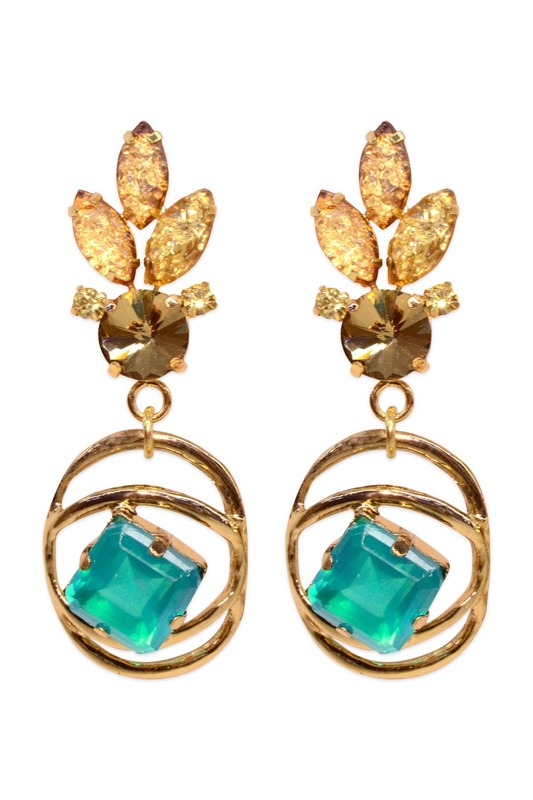 Not only are these earrings amazingly beautiful but they are also light weight. You forget you are wearing them because you can barely feel them. The emerald color is stunning. Rent these if you want a nice statement piece. I wish I owned these I would rock them with every outfit. Everyone wanted to buy these at the event I was at. I highly recommend these. I didn't love these. They looked a bit more costume-y than the photo, and were bigger than I expected. Maybe they would have been better for an evening affair with dimmer lighting, but for an afternoon garden party, I chose something else. Lightweight and stunning! You will not want to return these earrings. 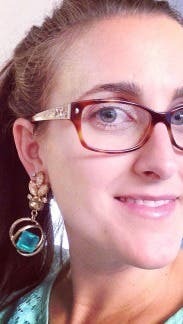 I rented these earrings to go with the Rahul Mishra Wild Privet Sheath and they are a bit heavier and larger in person. They were a unique color, though, and I really liked the gold and green tones and I did end up wearing them with the dress. I might wear them with a more simple dress next time to really ramp up the style. Loved these. You won't have to worry about seeing someone else with these on! 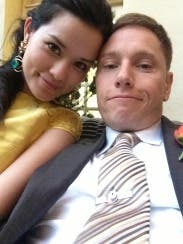 We were at the wedding for about 8 hours and towards hour 7 they were getting heavy. They made my red dress stand out against the other red dresses at our USMC Birthday Ball! I actually added these on to my order of the Badgley Mischka Listen To Your Heart gown for our USMC Birthday Ball in order to make my red dress stand out. I am SO glad I did! 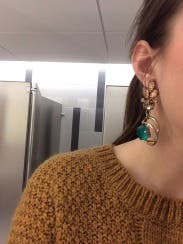 I got so many compliments on the ensemble outfit, but particularly these earrings. I actually ended up wearing them out in Vegas later with a black mini and black tank. They really make an outfit complete. I did not think they were too heavy. We danced and ran and played our way through Vegas from 4:30pm to 4:30am and I didn't even notice them once. I definitely recommend them as the pop you need for your formal or fun outfit! They were a little big for my taste, but with the right outfit they would be killer. This is the first time I've rented jewelry (I've rented many a dress), and I am so pleased with this piece! They look pretty large, but they are so light and comfortable. They were perfect to go along with a simple black holiday dress. Very large earring. Felt heavy to wear after an hour or two but very beautiful design. Love the contrast of the gold and green! 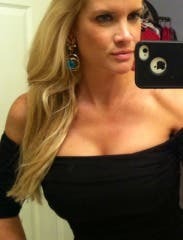 Wore these earrings for a great gatsby themed party. They were bigger than I was expecting but the color was perfect with my gold dress and I ended up not wanting to return them! 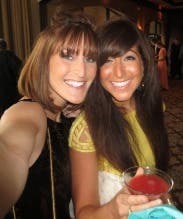 They were so beautiful my BFF borrowed them the next night to perfect her bachelorette look. Gorgeous, bright, intriguing, not too flashy, cool girls and glam girls alike will love. 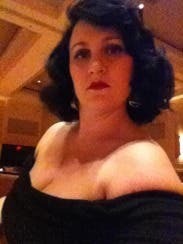 The earrings were a perfect compliment to the navy dress I wore. When I first put them on they were a bit heavy but did not bother me at all for the entire evening and I danced all night! I wore them to a black tie optional wedding and they really jazzed up a solid dress. Amazing earrings to pair with an amazing dress! Everything arrived 1 day early. Earrings were not too heavy. Very pretty but looked cheap close up. However no one really looks that close, went well with dress. Poor quality and heavy. I thought they looked tacky. I got these as the "mystery bling" and didn't think they looked right with my dress, so I didn't end up wearing them. Bummer. 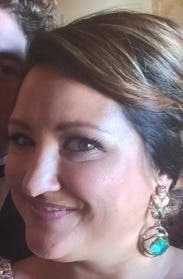 We attended a black tie wedding and these earrings gave the dress the look I was going for! 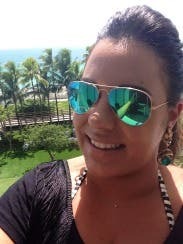 Although the earrings worked and gave me the pop of color I was looking for I was really disappointed in the quality. I think the price should be lower due to quality. I thought they would be authentic crystal - they were plastic and essentially costume. Again, they looked good in photos but be prepared for the gap in quality. I ordered these to complement my orchid/fuchsia dress, but they were much bigger than I expected. The largeness of the gold and aqua colored stones made them look a little cheap, to me anyways. I put them on and my fiancé said, "Oh...those are... different." I did not end up wearing them. I would suggest these earrings A) if you're the type of girl who usually wears big statement pieces or B) if you are willing to commit to wearing them with conviction all night. Not very heavy and I wore them all night without any problems! 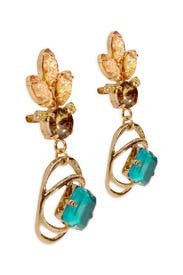 I wore these with a coral plain dress ... Earrings were very light weight they are not clip on... Instead regular earring that goes through ear .. Back holder is attached to earring and clips it in place .. Very comfortable ! 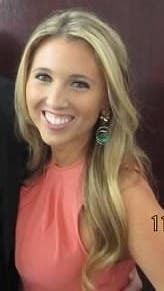 Color was a little bit darker green than I thought but still great with coral dress! I did not want to return them. They are a statement earring yet very lightweight so it doesn't bother you. They aren't too heavy and are stunning in person. I received compliments all night long. Rented these earrings to go with my bridal shower dress. They were beautiful. They were large but I think the photographs show their true size which is why I chose "true to size" when asked. They may have been a bit much if my hair were picked up with my particular dress but were perfect with my hair down as that pop of color that brought out the yellow in my dress. With a more simple dress they would work with hair up as well. ALso important to note that they were very light... not heavy. 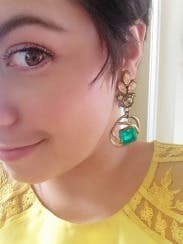 I thought these earrings would be heavy just by looking at the picture, but they were so light! These earrings are perfectly ostentatious! The perfect statement piece. They're way lighter than they look, but they're so big that they were inevitably a little uncomfortable by the end of the night. I held mine in place by a little clear earring stopper and was good to go! 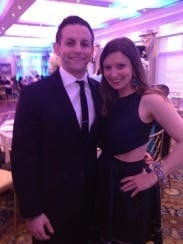 They looked ah-mazing with the Lela Rose Galaxy Tweed. It pulled the exact same green from the dress. Love. These were super fun to wear. Dressed up a plain sweater and jeans! These earrings were actually larger than I expected them to be from the pictures online. I LOVE over-sized accessories, so this was a pleasant surprise! Despite their large size they were surprisingly light weight. This is not to say that they looked cheap in any way! They have posts, but no backings, it is more of a clamp style which made me feel safe wearing them. I wore them on a vacation in Miami and only planned on using them for one outfit, but ended up mixing them into several of my outfits since they were so pretty! Would definitely recommend! Look substantial but are very lightweight - showstoppers! These earrings are really stunning in person. They feel cheap in the hand and are very lightweight but appear substantial and expensive when worn. Got tons of compliments! 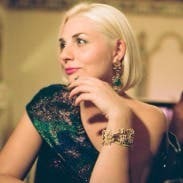 I paired with a simple gold Pam Love cuff. These need/deserve all the attention. 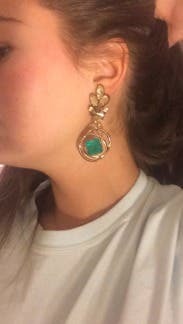 These earrings are amazing and comfortable!